Experiment: Cells were treated with a general phosphatase inhibitor for 1 hour, lysed and the protein digested, all the while using a phosphatase inhibitor cocktail. The resulting phosphopeptides were separated on an OFFGEL fractionator using low-resolution strips, pH 3-10. The fractions were cleaned up using zip-tips and were ran on an LTQ to determine if/where phosphopeptides aggregate during OFFGEL isoelectric focusing. 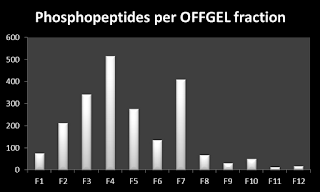 As predicted, the phosphopeptides seem to aggregate in the acidic range, with the exception of a large number of them that appeared in fraction 7, near neutrality. It is important to note that this was a single run per fraction as we're simply working on optimizing this procedure. The most interesting part to me is the fact that we were seeing unique phosphopeptides all the way to pH 10.